NOTE: Some of the documents are stored as Adobe Acrobat .PDF files, so they will print properly on any computer printer. You will need to install the free Adobe Acrobat Reader software on your computer before you can open these documents. Bridges at Westheimer Road and San Felipe Street that cross a drainage channel formally identified as HCFCD Unit W129-00-00 will require traffic detours while they are reconstructed as part of the Harris County Flood Control District's W129-00-00 Channel Enclosure Project. Changes in the construction schedule have delayed the expected detours from previously published dates. The bridges will not be under construction at the same time. Work on the Westheimer bridge is expected to begin in March 2013. The bridge reconstruction project will require traffic flow on the Westheimer bridge to be limited to one lane in each direction for up to a month. The Flood Control District will communicate more information about the Westheimer bridge closure as it is available. Work on the San Felipe bridge is expected to begin in summer 2013 and all lanes will be closed for up to two weeks. Both schedules are subject to change due to construction or weather issues. If their ultimate destination is not in the area, motorists are encouraged to avoid the area while the bridges are under construction or to use a detour route. Signs announcing the lane closure dates will be installed in the area prior to the closures. Motorists are encouraged to be alert, to pay attention to all posted street and lane closures and to follow traffic detours. The Flood Control District's $13.2 million W129-00-00 Channel Enclosure Project is rebuilding and enclosing the poorly functioning drainage channel. 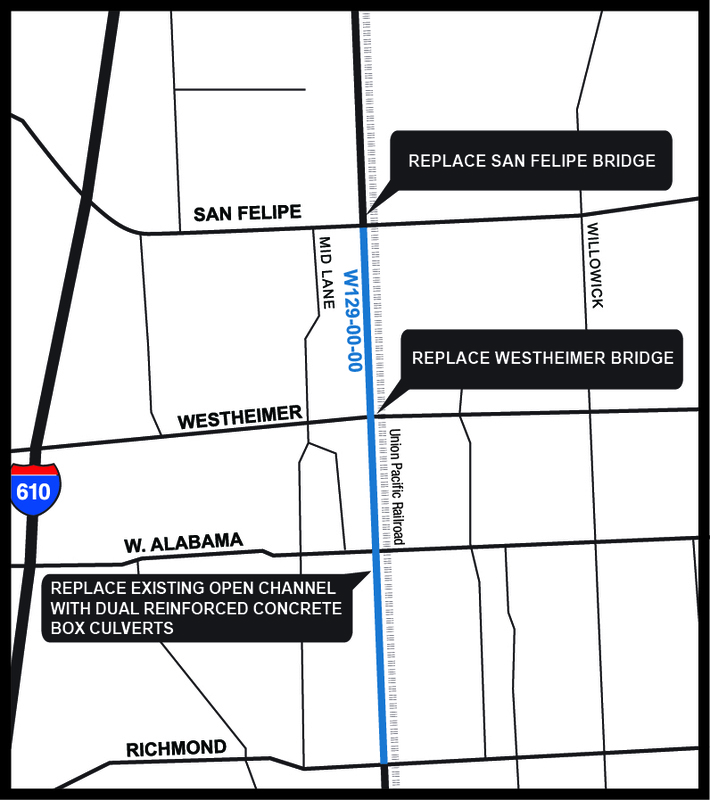 Started in August 2011, the project spans W129-00-00 from San Felipe to Richmond and includes enclosing the drainage channel with dual 12-foot by 10-foot reinforced concrete box culverts and replacing the bridges at Westheimer and San Felipe. The City of Houston is contributing funds to the bridge projects. For more information about the project, visit the W129-00-00 Channel Enclosure Project webpage at www.hcfcd.org/W129. If you have questions or comments, please call the Flood Control District's Project and Study Information Line, which is monitored daily, at 713-684-4040. To receive news and updates on the W129-00-00 Channel Enclosure Project, sign up.